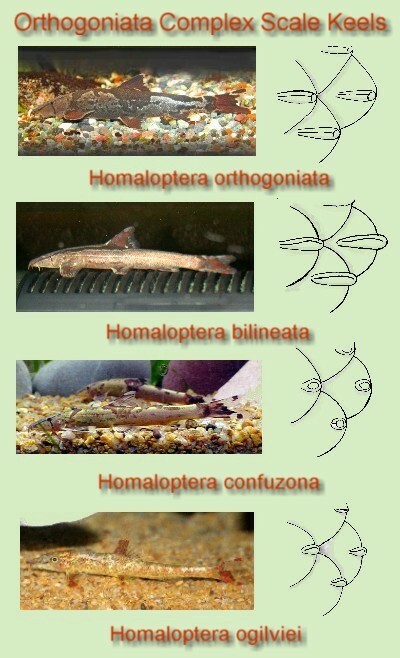 A graphic representation of scale keel shapes for 4 species of Homaloptera. This group of Homaloptera species (H. orthogoniata, bilineata, confuzona, and ogilviei) are very easy to confuse due to the vast overlap in body markings where one species may appear like individuals of another. Due to the complexity of markings in these species, where no two fish are exactly the same, it can be very difficult to correctly identify the species. For the aquarist, one of the few ways to determine species is by digitally photographing the fish's scales in the area under the Dorsal fin leading edge, and enlarging the photograph to show detail. As a guide, here are drawings of the scale keel shapes for four species.